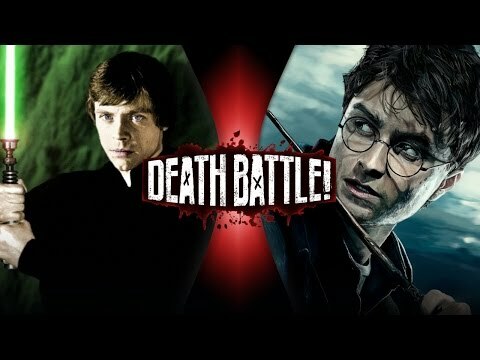 What if Luke Skywalker (RotJ) fought Harry Potter (DHP2)? Who would win? What's at Stake: Luke is fighting to save Leia's life, and Harry is fighting to save Hermione's. lol, I think Luke would crush Harry. HP is not super-strong in that series, even at the end. Wouldn't force choke basically win the day? Since spells require verbal utterance? Not necessarily, because wizards can cast with just focus as they become more skilled. The real question here is: Can a lightsaber deflect a spell? If so: SW wins, if not, HP. Why can't the dark lord block force choke? I think some spells could be blocked, such as Aveda Kedavra. However, if I spell is just a burst of light and not a beam or shot, then I imagine Luke could not block it back. I didn't think the killing curse could be blocked. But I agree, depends on what the spell is made of. But what about battle meditation? That could counter some spells. You have good points. The killing curse can indeed not be blocked. But could a Kyber crystal deflect it? The power of a kyber crystal can block force lightning. Has it blocked a force chock in the movies? I think the real question is who wins between midriff Padme and school girl outfit Hermione? NO. The correct answer is we all win.